So, I have to say that my mom is one of the dopest jewelry designers that I know! She just has a natural gift and I’m so proud of her for stepping out and starting her business and even more proud to sport her goods! 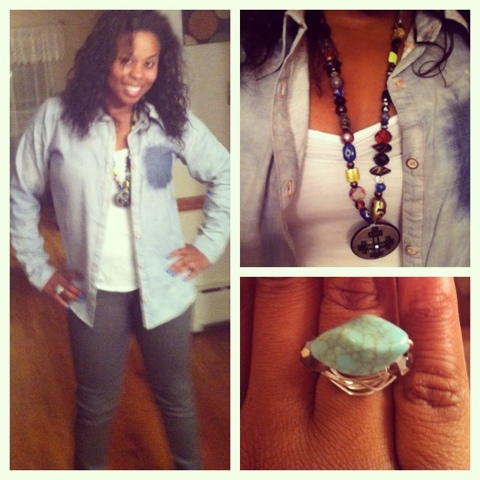 Today i’m wearing a multi-colored stone necklace that’s $20.00 and a wired ring with a beautiful stone for $10.00. My Skinnies and jean shirt are from J.C. Penny. I love them too! Make sure to check out more of my mom’s collection called “Intriguing Designs” on my blog!